Review #11366968 Amazing house and location A group of 11 adults rented this house for a birthday weekend/ family getaway and it was absolutely perfect. We had 2 couples in their 20s, 3 in their 50-60s, and a 20 year old. We explored La Jolla most days and spent quality family time at the house hanging out and cooking in the awesome kitchen and patio grill! The views from the deck are amazing (we actually think we saw whales in the Pacific our first afternoon there). Spent quite a bit of time lounging on the top deck patio furniture. 3 upstairs bedrooms and 2 baths (plus kitchen, dining, and living rooms), with 2 downstairs rooms, plus a den with sofa-ouch, and 1 bathroom. Absolutely perfect for 5 adult couples. The house was impressively clean. Great kitchen, living space, and a big dining room table for large groups. Kitchen, bathrooms, bedrooms, etc. were all clean and ready for occupancy. We walked around the block (literally) to the ocean, walked to make a bonfire on the beach at night, even walked to the little downtown area for dinner, breakfast, etc. The house was perfect and the entire rental process and stay was a breeze. We couldn't have been happier! - Family from DC. "Sensational Location, View, and accommodations" This was our first trip to visit San Diego and we did hours and hours of research on places to stay. We finally ended up with Harbor View and it truly exceeded our expectations. I would recommend it to anyone. Here's the reasons why: 1. The view: The pictures really don't do justice to how beautiful the downtown skyline and harbor is from the huge outdoor deck. It truly blew us away and we spent many hours taking it in on the deck. We watched the planes take off and land, could see the fireworks from Sea World, ate some of our meals out there, and in the mornings... watched the hummingbirds (wish we would have brought a hummingbird feeder) as the sun rose over the downtown skyline. If we owned the place we'd spend as much time on the deck as in the beautiful home. 2. The location: Not having visited San Diego before, we were somewhat at a loss on what area of town to stay. Staying here saved us tons of driving time. It kept us off the major highways to get to downtown and the beaches. This may have been the greatest benefit in staying here. 3. The kitchen: We cooked many of our meals and the bar (the biggest bar/island I've ever seen in a home), kitchen, fridge, sink(s)...etc. were really spectacular. 4. The master bedroom/bath: Great bed, bath, jacuzzi tub, closets. The other bedrooms were simple and had beds to sleep in, but the master bed and bath was really nice. 5. The space: we didn't really use about half of the home. There was an entire living area we only went to when we first arrived. 6. The service: I work in customer service and I'm very particular. I can tell you the friendly feel I received in scheduling this was the best of every company I talked with in trying to schedule this trip. It was really warm for San Diego when we arrived and they went out of their way to bring us a fan to make it more comfortable. There isn't an aC unit, as I'm sure it is really needed, but they were kind to help. Reviewer Location: Zapopan, Mexico - Date of Arrival: October 24, 2015 - Review Rating: 5 out of 5 stars - Review: Everything was very nice. The house, really good beds! The location. Thanks for everything. Review #7597040 Terrific condo in amazing location! Our family of 5 had a wonderful week at this unit. The view cannot be beat and the location on Mission Beach is fantastic. The unit was clean and had good starter set up. We had an issue with one of the beds after our second night, but Bluewater was terrific and handled the issue that day. The maintenance people were very nice. Just a 5 minute walk on Santa Clara there is a place called Baked that has great breakfast items and The Boardwalk is good for lunch and dinner. There is a Ralph's grocery store that is a less than a mile away North. You can drive or walk up the boardwalk. The garage is great, but the parking is a bit tight, especially if you are used to more ample, suburban type space. We had a mini-van, and we had to park diagonally in the garage to make it easiest to get out. I recommend the smallest vehicle that you can get by with during your trip. We were all very sad to leave. My kids already want me to book your next visit. Even after daily walks on the boardwalk, I did not see another place that I felt like would have been better. I highly recommend this unit and Bluewater rental. 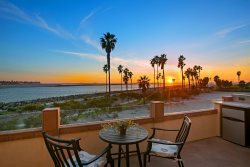 "Our family had a terrific time and very comfortable stay in San Diego" Bluewater Vacation Homes provided top notch service from search to stay. Kendra and Leanna were extremely helpful in helping us find a vacation home that was both affordable and available for our unique schedule. The communication, check-in instructions and follow through from this organization could not have been any better. If you are looking for professional vacation home services, I would recommend Bluewater Vacation Homes. The Yellow Bird House is a beautiful place to stay in San Diego. We felt right at home and could not have been happier. The house is very clean, modern and has all the amenities we have at home i.e. full kitchen, spacious rooms, wireless internet, cable TV, garage, etc. Lynn and Steve are very professional and helpful; they had great dining and entertainment recommendations and were just simply terrific hosts. The things we liked best about our experience with Bluewater and the Yellow Bird House are too many to list. However, the central location and the clean, modern house really made it easy for our family to relax and enjoy as much of San Diego as we could in a week. The house is not right on the beach (it faces an alley and the backside of an apartment complex), but it is literally a five minute walk to the bay where kids can go swim, picnic and gather sea shells. I would recommend using Google Earth to see exactly where it's at. Ocean Beach is a quick 8-10 minute drive around the bay where we had a blast swimming, bodyboarding and playing in the sand. SeaWorld, Balboa Park, Old Town, Downtown, the San Diego Zoo and the airport are all just 10-20 minute drives from the house. If you want to visit San Diego and feel at home while you are there, call Bluewater and stay at the Yellow Bird House. Reviewer location: Arizona Date of arrival June 27, 2015 Review rating 5 out of 5 Review #12216150 Blue Water Vacation homes Blue water rentals was awesome to deal with. They were very knowledgable about what to do around San Diego and helped out with all my questions. The rental was nice and clean. I would rent the same place again and also use Blue water again. thanks for all your help. Reviewer Location: Salem, UT - Date of Arrival: April 2, 2016 - Review#: 14464192 "Awesome family vacation!" - Review Rating: 5 out of 5 stars - Review: "This house is perfect! It comfortably fit all twelve of us. The pool, the indoor outdoor living, the proximity to the beach, the breezes blowing in at night all made this one of the most enjoyable vacations we have ever had. Bluewater was very accommodating to us and helped us with our every need. We loved it. We will for sure be back for another memorable vacation." Guest Location: Gilbert, AZ - Date of Arrival: March 17, 2016 - Review#: 14336458 "Great home with plenty of space" - Review Rating: 5 out of 5 stars - Review: "Great home with walking distance to pacific beach. Plenty of room and each bedroom has its own bathroom which worked great for us due to being multiple couples. The beds were very comfortable, reminded us of a high end hotel. The home was equipped with everything we needed." Reviewer Location: Phoenix, AZ - Date of Arrival: November 5, 2015 - Review#: 14525033 "Amazing house and location!" - Review Rating: 5 out of 5 stars - Review: "We stayed at this residence for a week with family from Canada. We had a blast! The house has so much space and was so comfortable for all of us to hang, make food and drink wine. The house has all you need with top notch appliances and comfy bed and bedding. We can't wait to return for another gathering :-)." Reviewer Location:Kinnelon,NJ - Date of Arrival: 8/27/15- Review#12915694 "Villa Pacifica was Amazing!" - Review Rating: 5 out of 5 - "Bluewater highly suggested this lovely home for my family group of 12 while we visited the area and attended my niece's wedding. I was hesitant to book it at first because it didn't have a pool but the staff at Bluewater assured me that the house would be a perfect fit for all of us, from my parents who are ninety to my 16 yr. old nephew. All the adults had their privacy, and the young adults in our family had use of a blow up bed, the pullout sofa and 2 roll away mattresses (which my daughters promptly set up in the media room). The central A/C was much appreciated as San Diego was in the midst of a rare heat wave! We all loved the house, its amenities and the gorgeous views from the roof top deck. It was walking distance to the ocean, shopping and restaurants. I highly recommend Villa Pacifica & Bluewater!" Reviewer Location: Scottsdale, AZ - Guest: Elke R. - Date of Arrival: July 1, 2016 - Review #: 15126442 - Review Rating: 5 out of 5 Stars Review: "Nicely appointed and a great location. Just a very short walk to the beach and Belmont Park. Since we vacationed over the July 4th week, Mission Beach was crazy crowded. We didn't have to drive anywhere! We walked and it was very refreshing. The condo was newly renovated, clean, and tastefully decorated. I would stay here again in a heartbeat! I was also extremely impressed with the management company Blue Water rentals. They answered all my questions, followed up with me and even called me during my stay to make sure everything was going smoothly. I am the owner of two vacation rentals in Hawaii so I can be very demanding and set the bar pretty high as to what I expected out of this vacation rental home. They met all of my expectations!" We absolutely loved this home! This is the second time we have used Bluewater to book our week at the beach and their customer service is top notch and they are honest and trustworthy. I would highly recommend using them and we will continue to use them each year. This house was amazing and is literally right on the beach. The front of the home is all windows and it felt like you we already on the beach without having to even leave the house. My mom is sun sensitive so this was perfect for her because the view was indescribable. The home is laid out nicely with plenty of space for everyone. The rooms were large and having 3.5 bathrooms was such a luxury. We had 6 adults and never felt like we didn't have privacy or room. The kitchen had everything we needed and the fridge was so large we were able to store everything we needed for the week. If you are looking for top notch service, a beautiful home with a million dollar view then Bluewater and this home are for you! I would recommend paying attention to the garage dimensions. We were able to fit a Toyota 4 Runner in there fine but the second space requires a small car. We were able to park our Toyota Camry on the street without a problem because it did not fit in the garage but that was my oversight as the dimensions are listed clearly. From stay in November 2016. "This was a great property to stay in. The interior is beautiful, especially the bathroom! The bedding was lovely and comfortable. The living space had plenty of room for people to sit comfortably when we hosted a dinner. The kitchen was very functional and I loved there was water and ice in the refrigerator as well as a Keurig and Magic Bullet blender available for use. We were steps from the beach and the community was very quiet. We were within easy walking distance of restaurants, shops and parks. Our hosts were extremely responsive and made sure we had everything we needed. I would recommend this property!" From stay in September 2016. Reviewed by: eek_19 from michigan Reviewed on: 04/17/2015 for their stay in 02/2015 539137 - Pacific Beach Cottage 2 The Pacific Beach cottages (there are four of them, pretty much the same) are great for a vacation rental. About 3/4 of a mile from the beach, less than that to 2 grocery stores. Lots of bars and restaurants nearby, but still very quiet at night. The cottages are very clean and fully equipped, with linens, plates, cutlery, and cookware, as well as appliances, 2 TVs and DVD players, and a propane grill. The Wifi was excellent: strong and consistent. Bluewater was very responsive when we had questions. I would absolutely recommend these cottages to anyone, and hope to stay in them again next winter.